The exocrine function of the pancreas refers to its ability to produce enzymes. These enzymes are important in digestion and breaking down larger substances into smaller particles or molecules that the body can absorb and use. The digestive enzymes include amylase to digest starch, protease to digest proteins and lipase to digest fats. These digestive enzymes are stored in the pancreas in the inactive form (called zymogens). They are released through a small duct into the duodenum and break the food down into small molecules as it moves through the small intestine. If these enzymes are not present, food is not broken down and the nutrients in the food cannot be absorbed and utilised. If the pancreas is unable to produce the enzymes in sufficient quantities we get the condition referred to as exocrine pancreatic insufficiency. This can also be referred to as maldigestion, which means that the food is not being processed and absorbed properly. The most common signs associated with the lack of digestive enzymes include a runny tummy or diarrhoea, which can sometimes be greasy and foul smelling and weight loss, despite an increased appetite. Other signs may include a poor coat, abdominal discomfort and increased borborygmi, which are the noises that can be heard when we say our tummy is grumbling. What causes decreased digestive enzyme production? There are three main causes of exocrine pancreatic insufficiency, namely acinar atrophy, chronic pancreatitis and neoplasia. These are big terms and we will take the time to explain each. Acinar atrophy refers to the condition where the glandular cells that produce the enzymes become shrivelled or small and are unable to function properly. 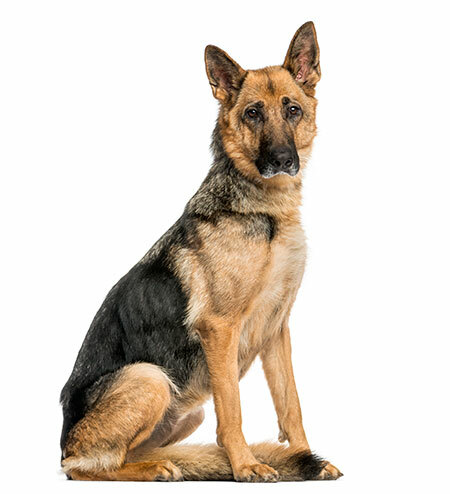 This process is thought to have a genetic component and German Shepherds are the most common breed to suffer from this condition. They are not born with the condition but it develops later on in their lives, commonly around four years of age. Rough Coated Collies are another breed that may be affected by atrophy of the acinar cells. Chronic pancreatitis refers to a long-standing inflammation of the pancreas. The pancreas scars (this is referred to as fibrosis) and loses a lot of its function. 90% of the pancreas has to be damaged before signs of the disease are seen. Neoplasia or cancer is the third cause of exocrine pancreatic insufficiency and this is where abnormal, fast-growing cells overtake the pancreas. In cats, chronic pancreatitis is the most common cause of the decreased production of digestive enzymes. There are several different tests available to diagnose exocrine pancreatic insufficiency. The most accurate test available measures levels of trypsin-like enzymes in the bloodstream. This test is known as the serum trypsin-like immunoreactivity test. A blood sample needs to be taken after the dog has been fasted or starved for a certain period of time for it to be accurate. Only a single blood sample is required. There is a similar test for cats but it is not as freely available. There are tests available to measure enzyme levels in the stool but these are not as accurate as the blood tests. How is exocrine pancreatic insufficiency treated? Treatment of this condition requires supplementation of the digestive enzymes. If available, feeding fresh or frozen pancreas from cows or pigs is the first treatment employed. This works very well but fresh pancreas may be difficult to get hold of and not everyone likes the idea of handling uncooked animal products. There are commercial formulations available, some of which may be very expensive. Most of the supplements given are digested in the stomach but the little that is not is enough to help with digestion in the small intestine. Powdered enzymes appear to work the best. There are tablets available but their absorption and efficacy seem to be a little unpredictable. It will be important to discuss the best option for your pet with the vet at the time of diagnosis. The supplementation of pancreatic enzymes will decrease the clinical signs of the disease but not completely control the diarrhoea. Vitamin B12 (Cobalamin) may need to be supplemented. The intestinal bacteria in dogs and cats produce this vitamin. Often there is an overgrowth of bacteria and instead of producing more Cobalamin, they end up consuming what is made. This leads to a deficiency in the dog or cat. Cobalamin is supplemented by initially weekly and then monthly injections. Patients may also suffer from inflammatory bowel disease and may need treatment for this. Can exocrine pancreatic insufficiency be cured? Exocrine pancreatic insufficiency is a result of the loss of functional cells within the pancreas. It is rarely cured but can be managed with appropriate therapy. Treatment is for life. With appropriate management and monitoring, the animal often gains weight, the stools improve and they can often live a normal life with a normal lifespan. If your pet is losing weight even though it seems to be hungry all the time, it will be a good idea to bring him or her to the vet for a checkup.